Calling All Snow Bunnies: Snow in South lake Tahoe! Grab your boards, schlep your skis, and pack the snow play toys! Winter has finally arrived in Lake Tahoe. The first snowflakes of the season are predicted to fall this evening and continue into Saturday. Predicted snowfall is described as moderate – heavy, we’re praying for the heavy stuff! Some areas may see as much as 8-14 inches of snow in higher elevations and 5-10 inches in lower elevations. Rain, high winds, and temps in the 40’s are expected to last through the weekend. Keep in mind, in conditions like these, the roads are slick and remember to drive accordingly. Now you can all do a happy dance – for winter is here! 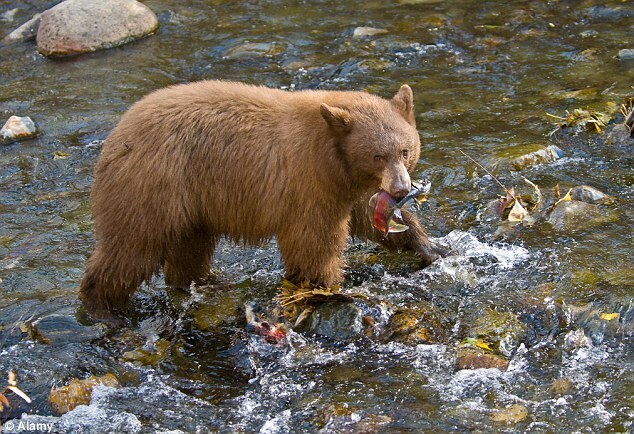 As normal, it’s the season bears are out and about trying to catch the seasonal salmon, but this time around the tourists reactions weren’t so normal. Visitors at Taylor Creek South Lake Tahoe, took full advantage of the bears sightings and many were attempting to take up close and personal ‘selfies’. Park officials have always encouraged picture taking, but never thought tourists would be putting their lives in danger to do so. People are forgetting these are wild animals that have the ability to attack when feeling threatened. Officials may have to close the popular bear sighting if this safety hazard continues. Be smart when interacting with wildlife! Take the time to learn more about your safety and the wild bears. Yelp is an amazing tool for consumers and businesses. In-fact, we truly believe that yelp has given power to the consumer and holds business owners accountable. We are thrilled to share with you that we are the proud owners of a five-star yelp rating! We take pride in our company; offering vacationers top quality rentals, excellent customer service and support throughout the vacation rental process. Looking at booking your next vacation in South Lake Tahoe? Don’t forget to check out RnR Vacationrentals and our five-star rating from past renters. We give our renterss an easy stay, ideal accomodations, and a true Tahoe experience. If skiing, boarding, and all activites in the snow are your thing, then you might want to consider spending this winter in South Lake Tahoe. South Lake Tahoe is the ultimate winter destination for the free spirited, extreme sports lovers, and those looking to experience life in one of the most sought after vacation destinations in the world! If you’ve visited the South Lake Tahoe recently you may have seen some beautification happening. From manicured sidewalks to completely updated buildings, and even new shopping centers, South Lake Tahoe is going through some mild gentrification. Amongst simple upgrades in the city are some serious business upgrades as well. Basecamp is one of several re-vamped Tahoe favorites. Another is 968 Park, an eco-friendly, LEED-certified boutique hotel in which everything from the granite in the bathrooms to the wood used in the elevator, from the kinetic metal sculptures to the corten steel exterior, is recycled. Down the street toward the beach, the Landing Resort & Spa, an upscale boutique hotel, with a five tar-rating. Across the street, in Stateline, Edgewood Tahoe Golf Course is bulldozing nearly its entire site for a proposed 154-room lodge, 10,000-square foot spa and 120-seat restaurant. And the late, though not lamented, Horizon Casino high-rise is undergoing a $60 million renovation and hopes to re-open “by ski season” as the Hard Rock Casino. Celebrity chefs galore! The 5th annual South Lake Tahoe Food and Wine Festival will return to Harvey’s Lake Tahoe on October 18th and 19th. Both celebrity chefs Rocco DiSpirito and Mark Estee will highlight the event. Events for this year’s Food and Wine Festival include lots of dining (obviously) and tasting experiences, plus discussions, presentations and demonstrations by celebrated food and wine experts. Of course, food and wine are the biggest stars and a spectacular “Grand Market Expo” – featuring sumptuous dishes from Harrah’s best restaurants, top-shelf spirits and the finest wines of Napa Valley and beyond – highlights the weekend. The South Lake Tahoe Food and Wine Festival kicks into high gear on Saturday, Oct. 18 with the “Grand Market Expo” at Harrah’s Special Events Center. Stroll through the Grand Market and enjoy ongoing, interactive entertainment. 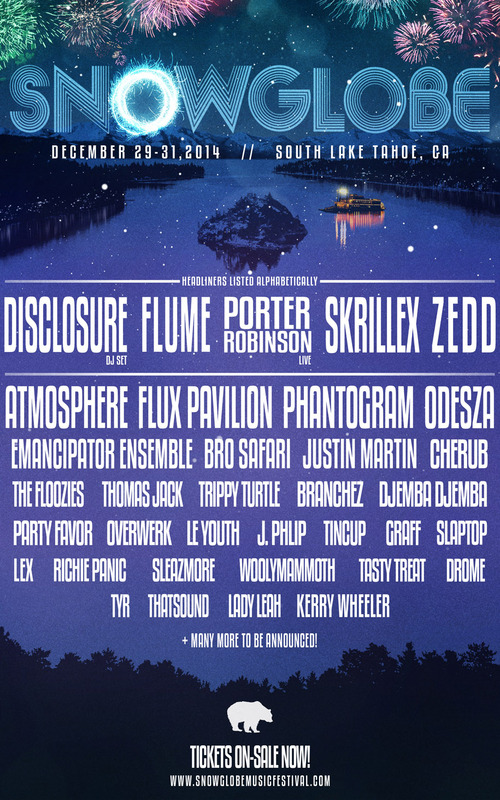 Snowglobe Line-Up for 2014 Announced! Festival fairies, concert goers, and music lovers! The 4th annual Snowglobe Music Festival in South Lake Tahoe has announced the 2014 line-up and its a good one! All we can say is that with each year this festival grows the headliners just keep getting better and better. Still early in its development, snowglobe 2014 has a must see list of house and dubstep DJs who plan to drop some sick beats on you this New Years. Don’t miss out on this years greats such as Skrillex, Zedd, Flume, Disclosure, and Porter Robinson! Other mentionable and newcomers to the scene include: Atmosphere,Phantogram, Flux Pavilion, Odesza,Emancipator Ensemble,Bro Safari, Justin Martin,Cherub, Thomas Jack,The Floozies,Branchez, Djemba Djemba and more to be revealed. Pack your gear and get ready for an unbelievable 4th year brought to you by the wonderful people at Snowglobe Music Festival. For more information and to buy tickets view the official Snowglobe website.